Ryuji Miki debuted a brand new race car at this year’s Formula Drift event at Wall, NJ. 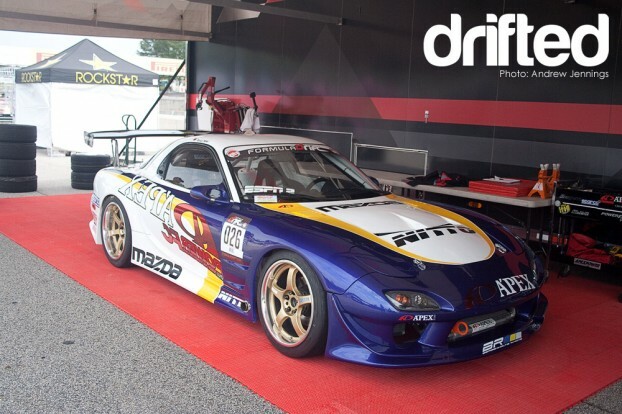 Before we take a look at what he will be piloting for the next few seasons, let’s walk down memory lane and see what the 2004 D1GP Champion has been using to challenge the USA’s finest. Click past the break to find out, and let us know through the comments which of these cars you’ve seen in person! The first time that I witnessed Miki’s driving was actually before he transitioned to America. In 2005, I attended a D1GP event in Tokyo at the makeshift Odaiba circuit (read: coned off parking lot course). 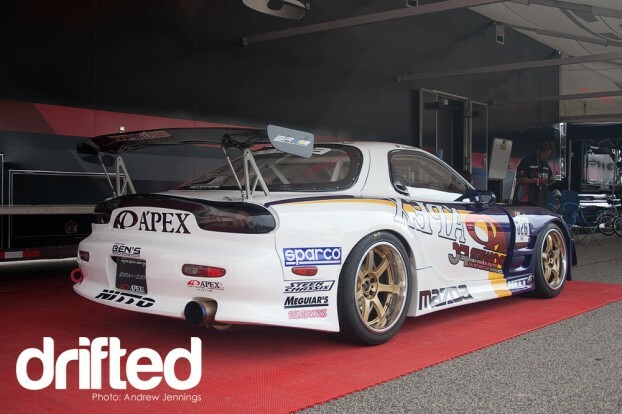 He was then sponsored by Top Secret, and in 2004 he successfully campaigned their Nissan Silvia S15 to the overall championship. A photo of the S15 can be seen here, via the Top Secret website. 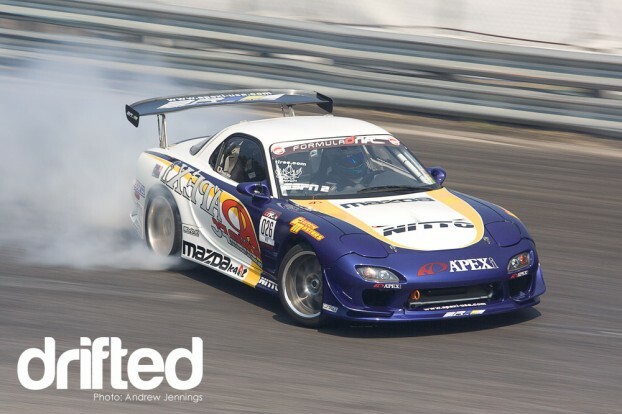 In 2007, Miki caught a deal with A’PEXi to transition into the Formula Drift series in the USA under the direction of Bergenholtz Racing. 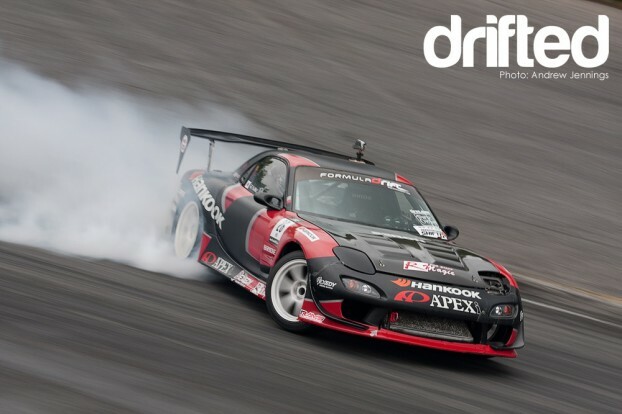 The car was a white FD3S, something that A’PEXi knows a lot about, having sponsored Youichi Imamura to the 2003 D1GP title in a strikingly similar model. The #26 car began its life in the States, which meant that it was left hand drive. Miki’s learning curve during the 2007 season included not only a brand new car on brand new tracks, but also a seat on a wrong side of the car! Previously he had only raced in right hand drive vehicles. Keep an eye on that steering wheel as this will resurface later on. Even with those challenges, Miki showed that he could quickly adapt to the change in scenery. By the third round of the season he was already contesting the top 16, and progressed to the great 8 in the final two events. He completed the season 14th, the highest position for any rookie that year. 2008 continued this strong momentum, picking up additional sponsors along the way. Check out the graphics on the passenger’s side of the car for 2008. In true JDM fashion, they are displayed as a mirror image of the driver’s side written backwards. The rear fender of the car also became a breeding ground of stickers. In ’07 it was blank, and then wham! Everybody wanted a spot, and the A’PEXi title sponsor had already taken the most prime real-estate on the doors. 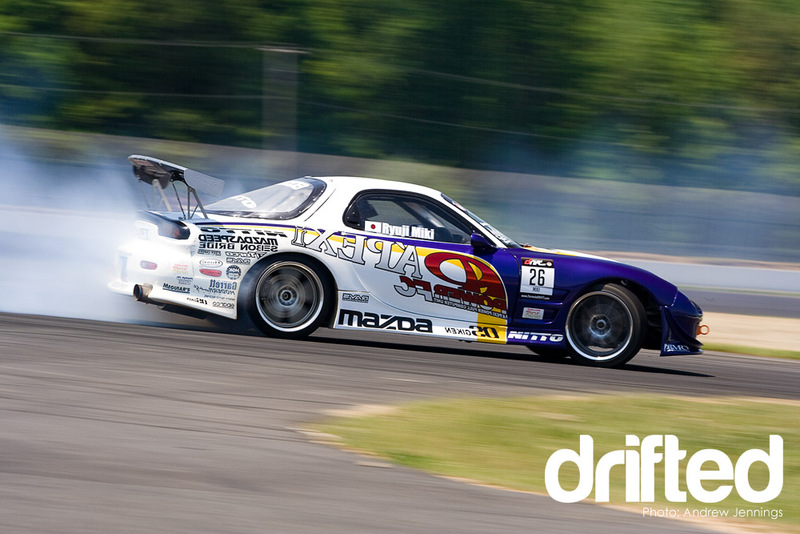 From a marketing standpoint, sponsoring the rear of a drift car isn’t always wise since this area is often concealed by tire smoke. BRIDE seats was one that took what they could get, and continue to sponsor Miki’s car today with an awesome set of Zeta IIIs. Flash forward to 2009. 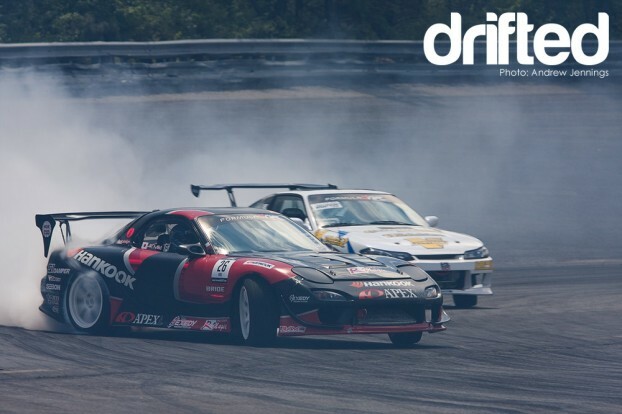 The silly season proved to be one of the most dramatic in the Formula Drift history as Miki and his lead sponsor A’PEXi transferred over to the Hankook racing team. The FD3S got a stay of execution and continued its life under a brand new matte-black paint scheme with a reflective red “A’P” outline draping the sides of the car. It was easily recognizable on track as a car from Hankook’s stable, but still unique in its livery. Notice something else that is different about the image above? Where is the driver? To continue his progression up the ranks, the team decided to swap the steering wheel over to the right side of the cockpit allowing Miki to drive the car more naturally. The tactic was effective as he achieved 2 podiums in the 2009 season, a 2nd place finish in Las Vegas and a 3rd place in Sonoma. At the start of the 2010 season, his car was largely unchanged. But rumors had already begun flying that something big was in the works from A’PEXi and Hankook for the former champion. Even though Long Beach and Atlanta were not his best showings, there was an ace in the hole that he was just itching to unleash on the field. I hope you enjoyed this miniature biography of Miki’s exploits. Stay tuned here at Drifted as we cover the new car that debuted for him at Wall to contest the rest of the 2010 season and beyond.